For those outside the United States, Black Friday is almost unheard or unbelievable in places – especially EUROPE 🙂 . There are stores that will open at midnight or at 3 AM or TRU that will open at 10 PM on Thursday night and stay OPEN for 24 HOURS! We know that there will be 4-packs for $10 at Walmart but will the Talking Mack be another CARS BF item? Not only are a HUGE SLEW of items on SALE already – Buy $75 worth and use the promo code – THANKS – get another 20% OFF AND FREE SHIPPING! El Materdor 2-pack, Unidentified Flying Mater (Light up) 2-pack, Tokyo Drift 2-pack, Paddy O’Concrete (single),& Heavy Metal Mater 2-pack. The other box sets: The NEW Radiator Springs 10-pack, & Piston Cup 10-pack. 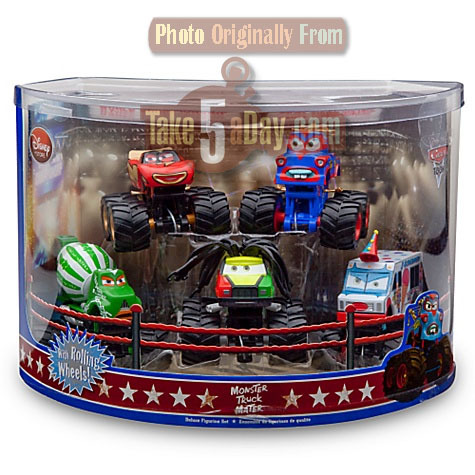 There seems to be a new Mater Wrestling 5-pack, I’m presuming the scale is 1:64 (ish) since it’s only $19.50 – on sale for $15 (let me know if you get it). Toys R Us Doorbusters start at 10 PM TONIGHT! Shop HOT Black Friday Specials at Toysrus.com! Enjoy great discounts on a great selection of electronics, video games, electronic pets, action figures, dolls and much more! Shop offers 11.25.10 through 11.28.10. 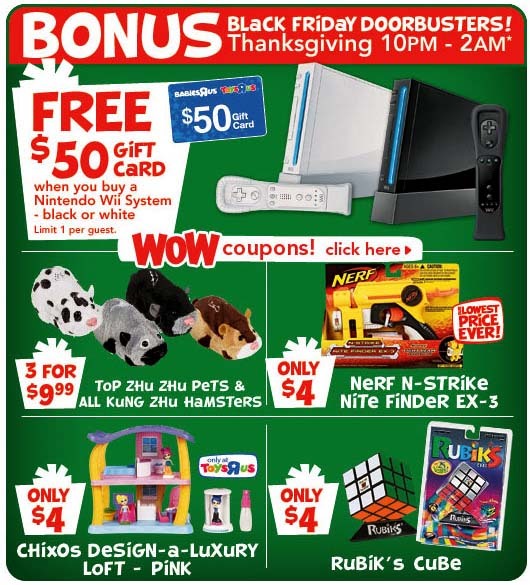 Shop amazing Black Friday DOORBUSTERS at Toysrus.com! Shop offers 10pm 11.25.10 through 11.28.10. Quantities limited! Check out the Black Friday MYSTERY DEALS at Toysrus.com! Offers good 10pm on 11.25.10 through 1pm on 11.26.10. Black Friday Weekend Savings! Check out HOT deals on video games at Toysrus.com. Offer good 11.25.10 through 11.28.10. Black Friday Weekend Savings! Check out HOT deals on electronics at Toysrus.com. Offer good 11.25.10 through 11.28.10. This year shop.LEGO.com is offer our best Brick Friday offers EVER. November 26-29th consumers will receive Free Shipping on orders of $49 or more, and orders of $149 or more will also qualify for 10% off! shop.LEGO.com will also be adding 5 New Sale items to the Sales & Deals Section every day November 26-29th. Sales are limited time only or while supplies last. 10% off $50 or more at BackToBasicsToys.com, 11/25 to 11/29 only. Use code AFFNOV3. 15% off $100 or more at BackToBasicsToys.com, 11/25 to 11/29. Use code AFFNOV3 plus FREE Shipping. 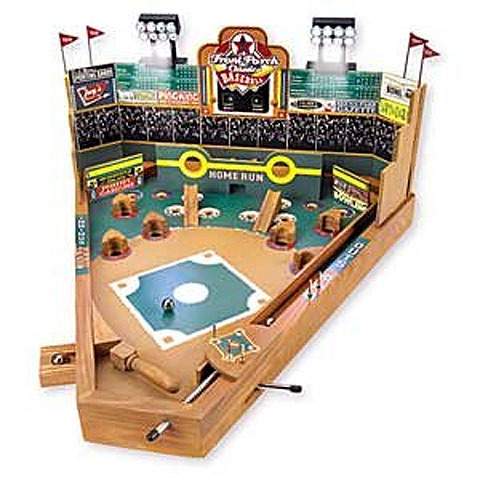 20% off orders of $150 or more at BackToBasicsToys.com, 11/25 to 11/29. Use code AFFNOV3 plus FREE Shipping. This comes with LIGHTS now! I am shopped out! We were at Target this morning at around 6 am. Got my 9 pack with no problem, no waiting at checkout. Went over to TRU. Long lines inside but there was nothing I was interested in. Nothing new in Cars, especially no Shiny Wax 🙁 Next…Disney Store. Again long lines. I would have gotten a few small items but didn’t want to wait on line so I passed. Next…Macy’s. Coupon for $10. off purchase of $25. so of course I had to use it. Got some Shiny Bright Christmas decorations. Then to another Target to return the 9 pack I bought last week for $39.99. No problem. Neither Targer had any new Team Pitty sets. A few other stops…Staples for free photo paper, Gap for 50% off all merchandise. I DID wait on that line LOL & Mickey D’s for fuel. Last stop Super Walmart. 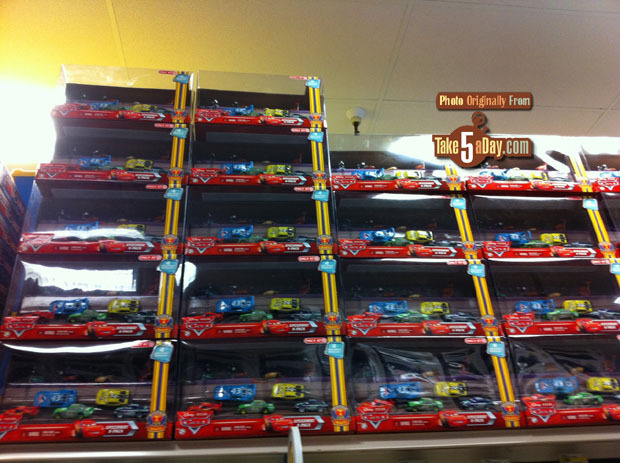 My neighborhood Walmart had the Cars ToyLand display up a few days ago but no Cars ToyLand display in this Walmart. They did have the new 4 packs for $10. but I didn’t get any. May go back tomorrow to buy a couple. 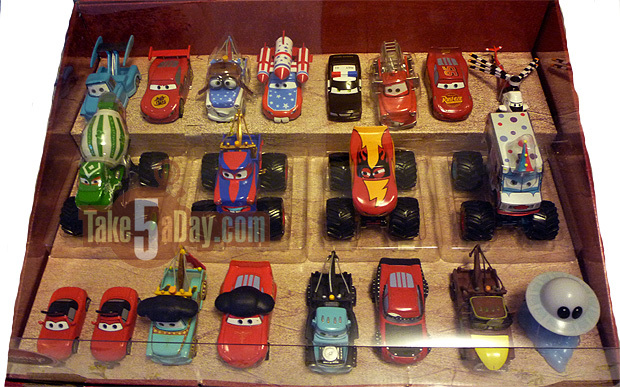 I’m wondering if the Mater is the metal one or the metal/plastic one. He looked like the metal one to me but it was hard to tell. Yep, the cats love chasing the zhu zhu pets around and swatting them with their paws. Highly recommended. The two dogs ignore them. Just visiting for the week. Stopped by Target here at 6:45 am (almost 3 hours after opening) and was not surprised to see a big empty spot on the shelf where the 9 packs are supposed to be. I am guessing people are just cruising the aisles, seeing $20 off a $40 item and grabbing one. I don’t blame them. Anyhow, I asked a busy looking clerk if there happened to be any more and he ran off to the back and came back with one. 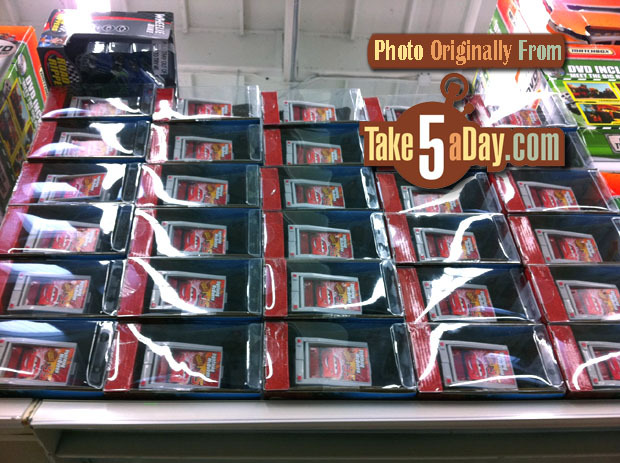 I guess this store just did not have room to stack them on the top shelves like some of the pictures on Take5 showed. This package is way too big to remain intact in my suitcase so it will be neatly disassembled and is now my opener. I’m back in my hotel room and everyone is still sound asleep since it really is still 5:30am west coast time! Went to a Target store around 4:15am. They had at least 30 of the 9-packs, and I’m sure I was the first one to actually take one off the shelf. The Target also had a couple of the Octane Gain and Bumper Save crew sets, though at the $19.99 price as usual. It was the Target on Broadway, up near the Wilson Red Line Stop. You may get lucky and still find them. 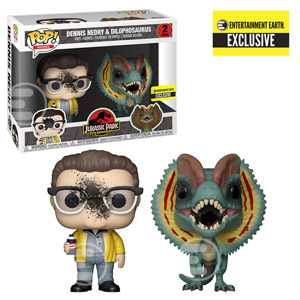 I’m pretty sure most people are just there mainly wanting to get Black Friday deals, so they might pass by the stocked pitty crew sets (since they are not on sale). Though I didn’t look through all the ones they had stocked, I know I saw at least one of each of the Octane Gain and Bumper Save sets. I went to Target after my aborted visit to TRU (see above). I had to wait in line for an hour and a half in freezing weather to get in. However, I did get the 9-pack I was after. On a whim, I stopped by the other Target in town. Pandemonium! The line to check out must have had 500 people in it! It snaked up and down the aisles throughout the store. Needless to say, I decided I did not need to buy anything there. Got back from TRU a little while ago, was too dark to take pics but the line to get in wrapped the entire building and down the parking lot. I got in about 10:20 due to occupancy limits and was able to get everything I wanted. No Shiny Wax haulers — only Gil, Trunk Fresh, and a lonely RPM. Btw, I have an extra 32gig iPod Touch if anyone wants it. Selling for cost – $300. slicepie@roadrunner.com if interested. Just got back from TRU…same stock as a few days ago, no haulers. What a madhouse!!! Was at WalMart tonight at about 7:30 – the 4 packs were in the garden section for $10. They’re in a box of 32 … only 6 of the tuners, 8 of the Sarge assortment, 18 of the Guido assortment. ours didn’t get them and I really wanted a correct boost and dj. I’m bummed. I checked online for those 4 packs at midnight NOT listed, checked again 3 am NOT listed now they show out of stock. I’m bummed I just wanted 1 correct dj. I checked 2 different Targets for the 9 Car pack yesterday and both had them marked back up to $39.99. Note the $50 gift card for Wii purchase is not automatic at checkout. You have to print the coupon online and bring it with you. Also, if you get the TRU catalog in the mail the gift cards on the catalog should be usable as well. Anyone see that the ad photo of the 9 Pack has Timothy and Houser Boon switched? (MET: iPhone 3GS has been $99 since the iPhone 4 came out. The rumor is there might be 10% off on certain items but not everything). Better to wait until January when Verizon gets the iPhone 4 with 4G service.